by Guzzini, Stefano; Guzzini, Stefano. Machine generated contents note: Introduction: the argument: geopolitics for fixing the coordinates of foreign policy identity / Stefano Guzzini; Part I. The Analytical Framework: 1. Which puzzle? An expected return of geopolitical thought in Europe? / Stefano Guzzini; 2. Which geopolitics? / Stefano Guzzini; 3. The framework of analysis: geopolitics meets foreign policy identity-crises / Stefano Guzzini; Part II. Case Studies: 4. Czech geopolitics: struggling for survival / Petr Drulak; 5. The theme that dare not speak its name: Geopolitik, geopolitics and German foreign policy since unification / Andreas Behnke; 6. Geopolitics 'in the Land of the Prince': a passe-partout to (global) power politics? / Elisabetta Brighi and Fabio Petito; 7. Turkey's 'geopolitics dogma' / Pinar Bilgin; 8. Banal Huntingtonianism: civilizational geopolitics in Estonia / Merje Kuus; 9. Russia: geopolitics from the Heartland / Alexander Astrov and Natalia Morozova; Part III. Empirical and Theoretical Conclusions: 10. 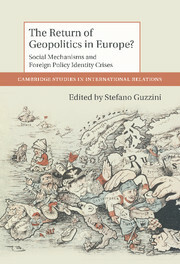 The mixed revival of geopolitics in Europe / Stefano Guzzini; 11. Social mechanisms as micro-dynamics in constructivist analysis / Stefano Guzzini. Summary: "The end of the Cold War demonstrated the historical possibility of peaceful change and seemingly showed the superiority of non-realist approaches in International Relations. Yet in the post-Cold War period many European countries have experienced a resurgence of a distinctively realist tradition: geopolitics. Geopolitics is an approach which emphasises the relationship between politics and power on the one hand; and territory, location and environment on the other. This comparative study shows how the revival of geopolitics came not despite of, but because of, the end of the Cold War. Disoriented in their self-understandings and conception of external roles by the events of 1989, many European foreign policy actors used the determinism of geopolitical thought to find their place in world politics quickly. The book develops a constructivist methodology to study causal mechanisms and its comparative approach allows for a broad assessment of some of the fundamental dynamics of European security"-- Provided by publisher. Includes bibliographical references (p. 278-315) and index. "The end of the Cold War demonstrated the historical possibility of peaceful change and seemingly showed the superiority of non-realist approaches in International Relations. Yet in the post-Cold War period many European countries have experienced a resurgence of a distinctively realist tradition: geopolitics. Geopolitics is an approach which emphasises the relationship between politics and power on the one hand; and territory, location and environment on the other. This comparative study shows how the revival of geopolitics came not despite of, but because of, the end of the Cold War. Disoriented in their self-understandings and conception of external roles by the events of 1989, many European foreign policy actors used the determinism of geopolitical thought to find their place in world politics quickly. The book develops a constructivist methodology to study causal mechanisms and its comparative approach allows for a broad assessment of some of the fundamental dynamics of European security"-- Provided by publisher.